QANDR flourishes in smaller group discussions such as focus groups (with up to 10 participants), where in a small setting everyone’s opinions are immediately and jointly visualised and discussed. However, the tool is equally at home in medium sized groups, such as the network meeting DeZorgwereldDraaitDoor where a group of 40 professionals from the sectors of health care, education and local government came together to discuss scenarios for Strategic Employment Planning. 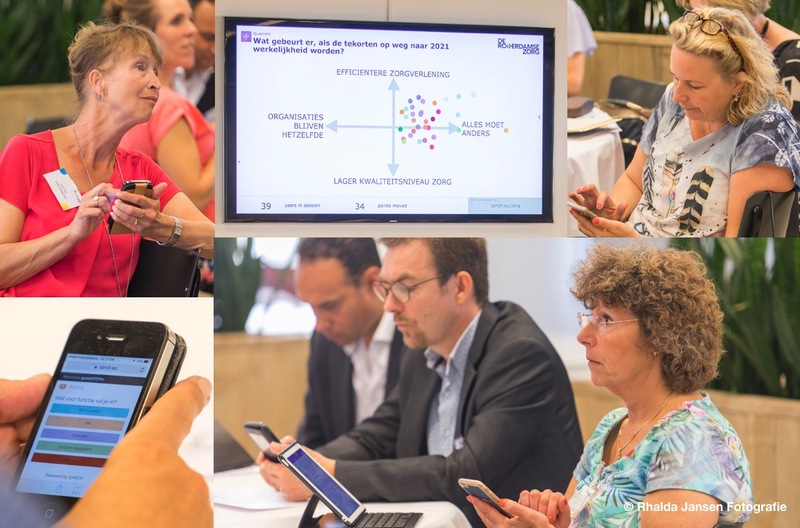 All participants were engaged from the start, using their smartphones to express their opinions, jointly visualised on the main screen. Not only was the session itself engaging and clarifying for all involved, the follow-up was a breeze as well. DeRotterdamseZorg could instantly take the visuals from the session and include them in their report of the event (in Dutch), saving time and making reporting more interesting and visually appealing.